A happy customer recently sent us this terrific photo of one of our rooftop campers in action. As you can see, our 4WD rental allows you to escape to secluded locations off the beaten track. And with the roof top tent, setting up camp couldn’t be easier. Customers often comment about how great it feels to travel light. With a roof top camper, there’s no need to tow a caravan or trailer. Everything is compact and lightweight. Easy setup allows to kick back and relax at the end of the day. Just as importantly, fast and easy pack down means you get going sooner. Who wants to spend hours rolling and packing tents? With a roof top camper, you don’t have to worry about wet tent floors or sweeping out sand. If you’re afraid of creepy crawlies, you’ll feel safer in a roof top tent. You’ll be less likely to be plagued by ants and other ground creepers. You’ll also be high and dry – which, despite the usual connotation, is a great thing to feel when you’re sleeping in the great outdoors! Even in warm weather, condensation can make normal tent floors damp and difficult to pack away. Renting a 4WD roof top camper avoids this problem. You’ll enjoy a smooth sleeping surface without uncomfortable rocks, sticks or slopes to make sleeping impossible. 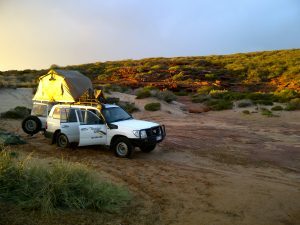 If you’re traveling with a group, you can choose to hire a rooftop camper 4WD together with a camping trailer. This gives you plenty of sleeping space and all the camping gear you need for a fantastic holiday. Not many really! Probably the biggest disadvantage would be that you have no permanent camp site. In other words, you need to pack up your tent when you want to drive away for the day. If you’d rather leave everything set up for a few days, you might consider hiring a camper trailer with one of our 4WDs. As you can see from the photo, rooftop camper rental is a wonderful way to experience Australia. If you’re keen to give it a go, give us a call or use the easy ‘quote’ form on this website to contact us today. Sorry for the late reply. Unfortunately, rooftop campers are temporarily unavailable. Please browse the home page for all available vehicles and contact us via our quote form for a fast quote. Cheers.